Planning a funeral and securing your family’s final resting place is undoubtedly an emotional process. CUYAHOGA FALLS, Ohio — Planning a funeral and securing your family’s final resting place is undoubtedly an emotional process. For one Akron family, however, it has been frustrating and infuriating. 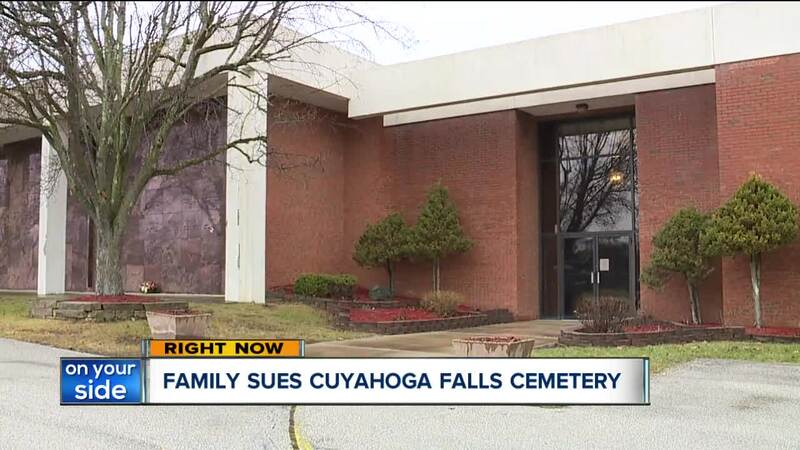 Six siblings of the Frammartino family have filed a lawsuit against the owners of a Cuyahoga Falls cemetery after they spent more than $70,000 collectively to secure crypts at a yet unfinished mausoleum expansion. Vincent Frammartino, the family’s patriarch, alleges Northlawn Memorial Gardens was fraudulent and remains in breach of contract after he and five of his siblings purchased mausoleum spaces in 2014 and 2017. A lawsuit filed on behalf of the family also alleges Northlawn and its parent company, Stonemor Partners, violated Ohio’s Consumer Sales Practices Act, in addition to inflicting emotional distress. Pennsylvania-based Stonemor is the second largest network of cemeteries and funeral homes in the United States. In 2014, Frammartino, 71, said representatives of Northlawn approached the family with the opportunity to buy space at a future expansion of the cemetery’s mausoleum. The opportunity made financial and practical sense because his parents, Angelo and Cecilia Frammartino, are already interred at the tomb, along with nearly two dozen other family members. The Frammartino family emigrated to the United States from their native Italy in 1960. In true Italian spirit, the family was extremely tight-knit. Four of the seven children and their spouses immediately signed on, paying for the spaces and ultimately receiving ownership in January 2015. The family was informed that the mausoleum would be built within the next few years, Frammartino said. Then, in the summer of 2017, the family visited their parent's crypts and noticed the mausoleum expansion was being built on the opposite side of the building instead of adjacent to where their parents are buried. When the family inquired, a representative of the cemetery reportedly told them it was never the cemetery’s intent to have it built near their parent's final resting places, the civil lawsuit alleges. A few months later, the siblings reached an agreement with Northlawn. As part of the agreement, Northlawn would cover the cost of moving Angelo and Cecilia Frammartino into the new mausoleum, in addition to providing the four siblings who had purchased crypts with a $2500 discount, the lawsuit states. Making the situation even more emotion was the fact that his parents would be moved posthumously. Frammartino said his parents wanted to be interred at the original location because of its proximity to some of the original members of the Frammartino family. After the agreement was reached, two more siblings signed on to be interred at the expanded mausoleum. The deal brought a discounted rate and interest free financing through the spring of 2018. As the months waned on, not only did the siblings never receive copies of their deeds or certificates of ownership, construction at the mausoleum came to an abrupt halt. More than a year after construction started, only the footers of the expanded building have been poured. The gravel substrate has given way to weeds and wildflowers. It was evident to the family that no one had been on site for months. Also in that time, representatives from neither Northlawn nor Stonemor returned the family’s calls, emails or text messages, the lawsuit alleges. Even a message the family’s attorney went unanswered. Frammartino, the oldest of the siblings, said the uncertainty is the most frustrating and maddening part of the ordeal. The siblings and their spouses are also extremely concerned they could eventually lose the money they have already paid to Northlawn. “We have no idea what’s going to happen at this point. We have already paid the money. Am I going to have to pay to go to some other cemetery now?” Zampelli said. The lawsuit, which was filed in mid-December, came just a couple of weeks after a separate lawsuit was filed against Northlawn, according to court records. Janet Shover, a woman from Cuyahoga Falls, bought adjoining crypt spaces for her and her husband at the mausoleum. However, after her husband died, cemetery officials told her that her husband’s casket would not fit in the intended space because of a ‘shift’ in the mausoleum, the lawsuit alleges. A Stonemor official said the company does not discuss pending litigation. Represented by Akron attorney, Jim Henshaw, the Frammartino family believes there are other victims out there dealing with similar issues at Northlawn’s mausoleum.